Standard Design - Includes standard rectangular blades and is normally used for materials having a viscosity up to 2,000,000 cps. Ross pioneered change can mixer design nearly 100 years ago. Today three unique designs are offered. This mixer is ideal for mixing and kneading viscous pastes under atmospheric or vacuum conditions. Capacities range from 1/2-pint through 750 gallons. Many options including jacketing for heating or cooling, vacuum or pressure, vari speed drives, etc. are available. 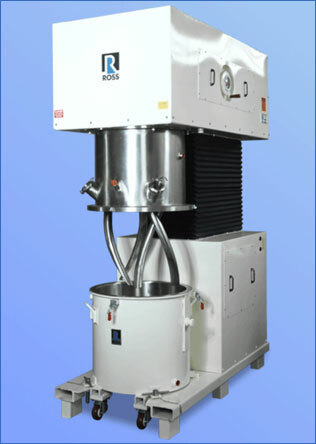 Double planetary mixers are ideal for low shear processing of viscous materials. Our High Viscosity "HV" blade design is ideal for mixing and kneading viscous pastes under atmospheric or vacuum conditions. The "HV" Blades each rotate on their own axes, and at the same time on a common axis, thereby providng complete mixing in a very short timeframe. The "HV" blades are perfect for the addition of light solids (such as fumed silica) that tend to float on the surface of a batch. Capacities range from 1/2-pint through 750 gallons. Many options including jacketing for heating or cooling, vacuum or pressure, vari speed drives, etc. are available. 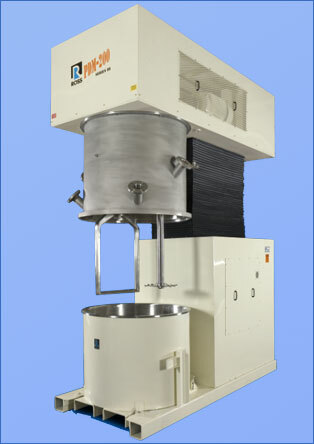 PowerMix Design - The PowerMix is used for materials requiring both kneading and high speed/high shear dispersion. The PowerMix combines a planetary blade and a high speed dispersion blade. Both agitators are in constant motion. The planetary and the high speed disperser blades rotate on their own axes and also rotate continuously around the vessel. The planetary blade feeds materials directly into the high shear zone of the orbiting high speed disperser. This combination of unique mixing actions combine to eliminate the need for multiple mixers that this one machine can accomplish. 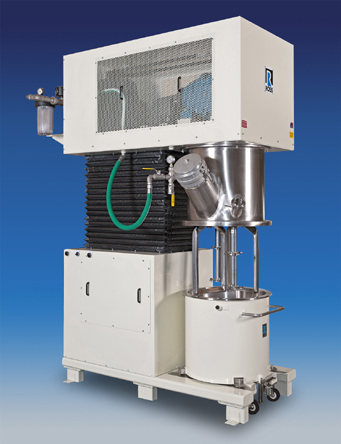 For applications that require a combination of high speed/high shear, the PowerMix (planetary disperser) is perfect. High speed dispersion can take place in the same mix vessel that will be used to blend in shear sensitive, viscosity building components. Capacities range from 1/2-pint through 750 gallons. Many options including jacketing for heating or cooling, vacuum or pressure, vari speed drives, etc. are available. 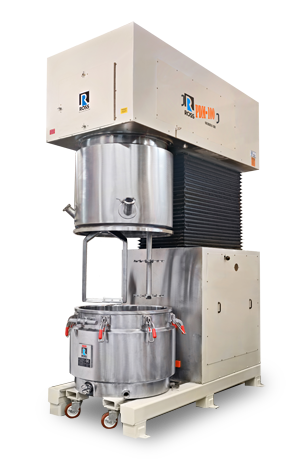 Planetary Dual Disperser - The Dual Planetary Disperser is ideal for materials requiring both kneading and high speed/high shear dispersion. This unit is equipped with two helical planetary stirrers, one of which includes a bottom scraper. Two saw-tooth blades are installed on each high speed shaft. A scraper arm removes material from the vessel wall to ensure superior heat transfer during the mixing process. 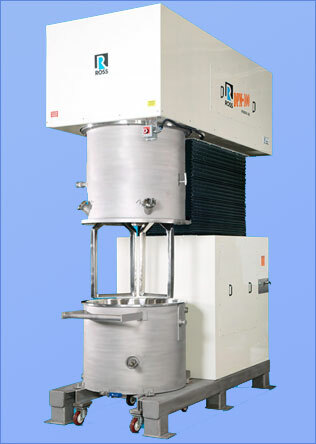 For applications that require a combination of high speed/high shear, the Dual Planetary Disperser is perfect. High speed dispersion can take place in the same mix vessel that will be used to blend in shear sensitive, viscosity building components. Capacities range from 1 through 750 gallons. Many options including jacketing for heating or cooling, vacuum or pressure, vari speed drives, etc. are available.